Last December Natalie contributed a blog entry to the Human Venture. The blog was about reading and its role in our learning. We thought it would be helpful to repost our contributions to the Human Venture here on our blog. Our work in project and change management is highly influenced by the study of Human Learning Ecology and we hope you’ll take the time to check out the Human Venture website and, if you’re in Alberta, check out local events. The winter brings us darker and colder days and nights. I love this time of year because it gives me the opportunity to read more, reflect on my learning and plan the year ahead. Reading is a critical part of our learning process. Reading for knowledge and understanding versus ‘simple reading’ takes practice and persistence. Think of reading as ‘empowerment’, to understand and engage in life learning. Tips for reading? You bet. My reading habits have changed tremendously since my exposure to Human Learning Ecology. The meta-framework has offered me a way to explore subjects that I hadn’t considered ‘interesting’ in the past. Economics, war and politics were not on my reading list. I shared these reading tips at the October alumni learning day. I hope you’ll find them helpful – especially if you have extra time over the winter to dig into reading some of the recommended resources. Practice: Read often, read daily, it takes practice to read well and build intellectual stamina. Retain and integrate: It’s important to find an approach that works for you. Mark up and tab pages or write in the margins. I like to note my thoughts and links to the meta-framework or other resources. Take note about what you’ve learned. I try to summarize chapters or a book in my own words to help me retain and to reference in the future. Read (yes read) the footnotes and references: There are always additional resources to support further inquiry in the footnotes and references. While you’re reading ask yourself: What is the author reaching for? How are people making meaning from this and why? How is the author constructing their caring? How are they thinking? What are they drawing on? Look for synergies between resources: Collect quotes in a journal, on note cards or in a digital tool to review and search for patterns. This will help integrate learning from across resources. Build your own library and resource files: Engage in your own intellectual hunting. Explore an area you find interesting or your own field of endeavor. This includes books, videos, movies and articles. Dictionary, thesaurus and search engines: Use these tools to understand statements or words that are not familiar to you. Do this each time until you read the statement or term and understand it in the context of the writing. Don’t be a Garbage Bear: We use the metaphor of the ‘garbage bear’ as a way of reminding us to read with purpose. Bears will eat garbage, not paying attention to the value of the food they eat. They consume for the sake of consuming. This can be harmful. Like bears, we can be indiscriminate about what it is we consume or read. What we choose to read (or watch or engage in) shapes our understanding of life, it shapes our meaning making. I am a part of everything that I have read. So, it’s not just reading, but also what we read that is important. Reading and disciplined inquiry are important to adaptively reconstruct our own thoughtscapes, or how we perceive and understand the world around us (actionscape). Reading and engaging with a broad range of cultural resources enables us to question our own programming – what and how we’ve learned. The list of books to read, like the booklist or what you’ve accumulated can be overwhelming. Instead of feeling overwhelmed by the number and breadth of resources, realize that it is a life journey and it’s not expected in a short period of time. No one is keeping score! Remember, when you are on the edge of your own learning it feels frustrating so just keep going, keep learning (and keep reading). Wishing everyone a thoughtful and reflective solstice and holiday season. What do we need from Project and Change Management in the future? Last November, Blythe and I hosted our colleagues and friends Mark Kozak-Holland and Ken Low for a unique discussion about project and change management. Mark is the author of many publications, including The History of Project Management. Ken is a founding member of the Human Venture Institute, an organization dedicated to the exploration of leading edge human and social development. The evening discussion explored the role of history, science, technology, innovation and the human spirit in bringing major human endeavours to life. Mark and Ken’s knowledge of human history, monumental projects and change is remarkable. They both draw on case studies from history that demonstrate the attributes and capacities required for meeting the greatest opportunities and threats of our species place and time in history. From climate change to political unrest, the projects and transformation required in our future are unlike challenges we have met in the past. History can tell us a lot about what to do, but also the ignorance to avoid if we want to succeed. The stakes are high and it will take unprecedented learning and action to course correct. The evening was video taped by our friends Chris Hsiung and Danny Cox. We recently edited the footage into a 26 minute highlight video. We believe it shares the essence of the discussion perfectly. Thank-you Danny for this video! Sharing this video and revisiting the discussion is timely as we head into 2017. The winter solstice and holiday season are around the corner. A time to pause and reconnect with friends and family, but also reflect on how we can individually and collectively learn and contribute to a promising future. Through our studies in Human Learning Ecology, we have been working to understand how human beings make meaning and the implications for social progress. Given our work in organizational change and culture, we are especially interested in the transformation & reconstruction of organizational cultures so they enable sustained, progressive change. In this blog post we explore how we’ve been implementing change management principles with an initiative designed to support change in the social sector. For the past three years I’ve had the fortune to work with the First 2000 Days Network leading strategy development and implementation, with a strong focus on culture development. The First 2000 Days Network is an initiative focused on improving outcomes for children in their first two thousand days of life, before they enter the formal school system. The impact of investing in early childhood development for society is significant: estimates put a minimum of a $1:8 ROI on investments in early childhood development. Healthy child development – especially before the age of five – can have far reaching societal effects on school outcomes, job and workforce readiness, and crime prevention to name a few. Working on this initiative has been a huge learning curve on so many fronts, especially in how to implement change management and organizational development principles in the social sector. What makes the First 2000 Days Network unique? This was a new initiative, essentially in a ‘start-up’ phase in terms of its maturity. There was no staff, no strategic plan, no project charter and very little formal organization. No centralized organizational capacity or formal authority. The various functional roles of the initiative were widespread amongst many different players, not all working for a single agency or organization. No funding. At the beginning of my involvement, the initiative didn’t have any project or sustainable funding to support its ongoing development. Supporting how work was being done, not just what was being done: my role was mostly about changing thinking and behaviour patterns, not executing the tactics of a Project or Change Charter. All of these factors meant there were high levels – and many types – of uncertainty in guiding the initiative forward. My role in helping to lead the development of the initiative shifted from trying to embed a formal change process onto the initiative to focusing on how to embed and integrate a change culture in our development: no change plan was going to be able to match the very fluid, dynamic, complex set of challenges we were facing both internally and externally. It’s likely helpful to flesh out the two major theories, or frameworks, that were guiding the development of the First 2000 Days Network. The First 2000 Days Network skews strongly toward being an ‘organic’ network (vs. a mandated one which is often the case with ‘change networks’ within formal change management processes). This means that stakeholders engage in the First 2000 Days Network at their own will – they are not required to be there and do not ‘report’ into a formal authority structure. To top that off, the people involved do not work for a single parent organization or entity. The players are from a diverse spectrum of organizations that have existing programs and services that serve children. Networks, especially organic ones, function at the speed of trust. Trust and perceived value among network participants is the ‘currency’ of networks. Therefore, the quality of the Network is indicated by the levels of trust and value among Network participants. The First 2000 Days Network is very focused on HOW network participants work together, as much as on WHAT they were doing to improve the lives of children in Calgary. The second framework guiding the First 2000 Days Network is the Collective Impact framework. Collective Impact outlines a way of guiding many different stakeholders toward achieving a collective impact around a common social goal. The image above illustrates both our Network’s structure and the key functions of the Collective Impact framework. There is a team at the center of the Network that takes responsibility – sometimes paid, sometimes volunteers – for leading key elements of the Collective Impact framework. That group is called the ‘Backbone’. In our case, the membership of that group was primarily made up of individuals who self-selected to the First 2000 Days Network and brought their skills to the table voluntarily (one characteristic of an organic network). As a way of linking the efforts of the Backbone team with key stakeholders in the early childhood development sector, we created feedback loops with other initiatives, organizations or individuals as a way of creating connections out into the broader territory, and feeding that work back into the Backbone, and back out again. Our Change Agents and their links with the Change Collectives self-led and self-managed, with learning links (feedback loops) built in to the Backbone activities. Results are fed into the Network’s Learning & Evaluation Strategy to ensure coherence and fidelity. If Networks are built on trust, then the core of our culture needed to be focused on trust. Building trust in an informal, mostly voluntary, immature organization is very time consuming, as it relies heavily on one-on-one relationships, built in different contexts over time. Part of building trust and the type of culture you strive for is to model the kinds of behaviours you want to create in the entity. A key part of the Network’s culture is a focus on adaptive learning. This means being extremely tolerant of failure, supporting the need to test new ideas, create space and time to integrate learning, supporting innovation and adaptation and integrate reflective evaluation efforts at every level of the initiative. Creating and supporting a tolerance for very high investments of time. One of the structural components we initialized was a weekly meeting. That sounds like a ‘given’ – but in an initiative with no formal leadership, no paid positions, voluntary participation and no plan – that is a HUGE ask. We knew enough to know that meeting once a month like many committees do would not be enough to move us forward, especially in terms of building a distinctive culture for the Network. We needed to try to build in characteristics of a highly effective team in the absence of knowing the game we were playing, and they only way we could do that was face-to-face, as often as possible. Because of the high levels of uncertainty, we were very aware to be open to changing decisions quickly if they weren’t working. One example is how we had ‘inherited’ a governance model that everyone initially accepted. Over time, however, it was clear that we had a governance body before we knew what they were governing! The existence of a Steering Committee, for instance, was premature in the early days as the Backbone – or core team actually executing the work – wasn’t at a stage where we could clearly articulate what we needed Steering for, or when. We disbanded the initial governance structure after the first year and now match our governance more organically to our culture, and to what specific Change Collectives were in play at the time. Because we didn’t have a conventional Project Charter to follow, our engagement strategy came from a mapping exercise that identified all of the “key” players in the Early Childhood Development system in Calgary – essentially those individuals or organization that held official positions of power or influence. It was very easy to fall back on thinking we needed to just go out, and ‘engage’ these players in the Network. On paper, this looked good, but in reality it often did not support the key aspect of a Network: building trust. We took a step back from conventional stakeholder engagement and used our desired outcomes (essentially our quality standards) to guide a more proactive, deliberate (albeit slow!) engagement approach. This allowed us to prioritize our engagement efforts through building capacity in stakeholders to improve their performance against our idea of quality: quality for early childhood development but also for building a quality network and a quality collective impact initiative. Essentially, we used our quality standards to assess capacity building, which in turn informed our engagement approach. The Network’s first formal hire was an evaluator, with the capacity not just to measure outcomes for kids (which would be a conventional success metric for an entity that exists to improve outcomes for kids) but who could also take a critical approach to the ongoing development of the Network, and feed that critical view to the Backbone team in order to inform strategies and priorities of the Network. In conventional change management projects you have the sponsor, or the Steering Committee, who gets reported to on the developments of the project at regular time intervals. In our case, the sponsors, steering committee and staff were all the same people: having an external set of eyes to observe and provide feedback loops on our development was key. This allowed us to eventually create a Strategic Development Plan that was informed not only by what kids need to grow up healthy and thriving; but to ensure the Network is healthy and thriving too. In Collective Impact, one of the main framework elements is to develop a ‘shared measurement’ approach. One of the common traps of the term ‘shared measure’ is that people automatically assume that means everyone needs to measure the same thing. In our case, there were many debates about which specific aspects of early childhood development the Network should stand for. Was it literacy? Play? Maternal health? We realized early on that if we pegged the Network against forcing everyone to measure the same thing around Early Childhood Development that we would fail: why would a health agency get on board to measure literacy? They wouldn’t. And yet, we knew we needed health at the table… So, instead of using ‘shared measurement’ as a top-down, single-source approach, we decided instead to focus on building the capacity of all the players around the table using a shared approach to quality. In essence, we use five key principles of healthy families and children as our quality standard for what capacities should be built with Network participants, which will ultimately improve their ability to serve and support children. Understand the nature of the challenge, including the types and sources of uncertainty. Managing a mandated, top-down change network is going to present very different challenges than an organic community of practice, for instance. Know what those differences are and the implications for your practice. Pay as much attention to how you are supporting the culture of the project, as to what the project is about. (function vs. form) The project may have very specific and predetermined outcomes but HOW you achieve those, in order to build sustained capacity for the project to succeed over time, is important. True change requires a high level of tolerance for failure, messiness, adapting and learning. Not all change projects are supported to do this or see this as a key feature of their process. Beware! Don’t understand too quickly: if you are leading a network or change project, the worst thing you can do is assume you know what needs to happen. You might end up being right, but take the time to check your assumptions and engage in real conversation about what’s needed for the network to make progress. Match your learning and actions to reality! To read more about the First 2000 Days Network’s approach and its efforts to enable social change, you can read our case study “Establishing the Pre-Conditions for Systems-Level Change in Early Childhood Development”. The military is not the first example that comes to mind when you think of organizational change case studies. Through our studies in Human Learning Ecology, we were introduced to the book Forced to Change: Crisis and Reform in the Canadian Armed Forces by Colonel Bernd Horn and Dr. Bill Bentley. Our entry point was transformation and reconstruction of institutional and organizational culture. What does it take to transform or reconstruct institutional cultures? What can be learned from this case and applied to organizations we work with? So why would Canada’s armed forces need to change? What problem were they trying to solve? Understanding the case for change requires a bit of a history lesson, but to summarize, operational standards, processes and philosophies were out dated, and quickly becoming misaligned to our post-Cold War society. Historically the culture of the armed forces was “a very hierarchical system that relied on an industrial age understanding of leadership, specifically directive, authoritarian approach” (p. 29). Post-secondary education was not necessary and preparation of individuals to higher levels of command were “premised on experience training, not education” (p. 30). “Through the years, the myopic view and isolation created an officer and Senior NCO (non commissioned officer) corps that were intolerant of criticism, self-scrutiny, or wider intellectual stimulation. They focused on process and nurtured a culture wherein experienced Cold War technicians, who did not rock the boat and supported the status quo, tended to do well” (p. 29). The CAF culture hadn’t evolved to support the geopolitical and societal changes post-Cold War. The philosophies governing how they understood and responded to situations at home and abroad were unhelpful and sometimes even harmful. The Canadian government made multiple requests of the CAF to improve officer training and to include higher education in recruitment and development. Eventually, over the years and into the 1990’s, the armed forces lost the support of the government and Canadians. Ongoing reports of unprofessional behaviour like public drunkenness, inaction within the ranks and the eventual killing of a detained teenager in Somalia in 1993 resulted in loss of funding and the ability to self-regulate. By 1993 not only the Canadian government but also the general public was forcing the Canadian Armed Forces to change. The problem? The CAF lacked oversight to assess the situation they were in and see the trouble their organizational culture was causing. The existing hierarchical, authoritative and technical culture and underlying assumptions remained unchanged for decades and they believed “we did nothing wrong” and “education is not important” (p. 68). Over the years, requests to change came from external government committees. The case for change wasn’t championed from within. Varying degrees of resistance and superficial changes plagued CAF through the years. Organizational culture reconstruction requires an assessment and understanding of how thinking and learning is done within the organization, the will to examine practices and beliefs, and being open to change. Calling into question an organizations’ practices, identity and allegiances requires being progressive and open to change and self-review. The CAF were drawing on helpful resources for institutional change and leadership, including Edward Shein’s organizational culture model, identifying espoused values and assumptions. However, they didn’t have a good understanding of the resistance they encountered and is still in place today. Like superficial changes fail to transform an organization, a superficial understanding of organizational culture, philosophies and belief systems also fail. The organization must be open to questioning their operating philosophies and belief systems, defining the future state and willing to do the work to get there. It’s also not enough to just define the future state, organizational structures like hiring practices, reward systems and professional development programs, need to be adjusted to support the future state. The CAF assumed that post-secondary education and master’s degrees would be the answer to their challenges. They do not explore how or what kind of education specifically. Humanities? Science? History? This indicates that they didn’t have enough of an understanding of the issues they were facing or what kind of intelligence was required for the officer class. They expected that post-secondary education would provide the capacities required to learn how to learn and learn how to inquire. Learning how to learn and learning how to inquire are critical for the CAF and to developing an adaptive organization. If learning and inquiry capacities are underdeveloped an organization won’t have the ability to diagnose challenges or take advantage of opportunities. In the case of the CAF, they weren’t able to see their own limitations as their operating procedures and philosophies went untested beyond the organizational boundaries. When organizational learning is untested or unverified outside the organization, the result is a closed loop – this can be unhelpful if change is required. In the case of CAF it can be harmful if they are unable to adapt to dangerous and changing environments. So what can be learned from the case of the Canadian Armed Forces? Transformation or reconstruction of an organizational culture requires a willingness to examine the beliefs and philosophies in practice and be open to self-review and change. Transformation is likely to fail when leaders within the organization do not champion the change. Externally mandated change may happen in the short-term, but is not sustainable if underlying beliefs and philosophies remain unchanged. A superficial understanding of culture is not adequate. Understanding organizational culture must include identifying the espoused beliefs and philosophies and comparing them to the behaviors in practice. Unless an organization looks beyond its own boundaries to verify and test their thinking and learning, the result is a closed loop and self-affirming. This is an organizational culture case study that we’ll monitor for the years to come. On November 26th Blythe and I are sponsoring a unique discussion in support of the project management, change management and leadership communities in Calgary. It is likely to be a thought-provoking evening for any practitioner looking for a new way to see their role and profession, and a great networking event too. Building a bridge. Building a railroad. Building humanity. 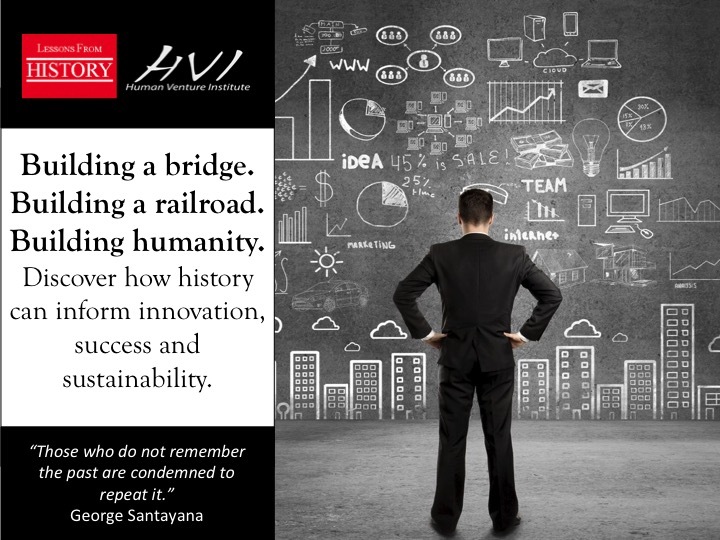 Discover how history can inform innovation, success and sustainability in project & change efforts. Join Mark Kozak-Holland, author of Titanic Lessons for IT Projects, and Ken Low of the Human Venture Institute for a discussion on the role of history, science, technology, innovation and the human spirit in bringing major human endeavors to life. Mark Kozak-Holland’s work focuses on the role of history to inform innovation in project management. His work links the fields of science, technology, engineering, leadership & innovation to the discipline of project management. As a result, he has developed the “lessons-from-history” series, (www.lessons-from-history.com) , “using lessons from the past to assist projects of today in shaping the world of tomorrow”. His work recognizes the importance of understanding history in order to shape innovative, systemic-level approaches to development. Case studies include: the Titanic, the leadership of Winston Churchill, the Trans-continental railroad, the Great Escape, amongst others. Ken Low is the founder and president of the Action Studies Institute [est. 1983] dedicated to mapping out the dynamics of adaptive intelligence in human systems and pioneering the development of a new discipline; human learning ecology. The driving motivation behind this research is the need to understand the underlying causes of adaptive and maladaptive development and behavior in individuals, organizations, societies, and cultures. The research draws on successes and failures of human learning and activity across cultures, sectors, disciplines and periods of history. The patterns of emerging adaptive intelligence found in the human story provide a structure for the human venture, a disciplined framework for understanding human progress, folly and resistance, including the systemic adaptive challenges facing humanity at our time and place in history, and what it will take to meet them. Ok, so it was June since our last post. Time to start sharing again. Like everyone else around us, we’ve been busy. Working with clients, raising little people, starting a new non-profit foundation with our Leadership Calgary colleagues and attempting to enjoy our short summer, which seems to now be a distant memory. Jumping right to it, as we’ve stated before, there is much to be learned from aviation and its non-stop work in safety and regulation. The aviation industry has worked decades to understand what standards and behaviors are needed for safe operations and how to incent these behaviors through a transparent and learning culture. A client of ours passed this article on to us a while back and we’ve been meaning to share it. It came from one of our management of change (MOC) team members and we’re super impressed that they were paying attention to this and linking the work they do in oil and gas to aviation standards. Our client realizes that the standards and processes they put in place have an impact on how people do their work and ultimately impact the overall organizational culture. Incenting the correct and needed behaviors is a priority in safety critical positions, protecting people and the environment. The article looks at three recent US air crashes, linking them to ‘go-arounds’ – when pilots abort a landing and try again, research sponsored by the Flight Safety Foundation. It’s quite well known that takeoff and landing are the two most high-risk activities during air travel. There is an incredible amount of discipline and regulation in place to ensure that these two major activities are done near perfect each and every time. Pilots make mistakes though. Why would they make mistakes if there is so much rigor put into these activities, in specific, mistakes in when to go-around? Standards can incent the right or wrong behaviors and without measures and feedback loops in place, wrong behaviors may go unnoticed, and in the case of air travel put many lives at risk. Thankfully organizations like the FAA, the Transportation Safety Board and the Flight Safety Foundation are in place and pay attention to patterns, looking for opportunities for improvement. As we pointed out in our last post, these organizations foster an open and transparent safety culture. Lessons from incidents are shared not only within the impacted airline, but also across the industry. Safety outweighs the need for competitive advantage because unsafe operations in some airlines would have an overall negative impact on the industry. A ‘continuous improvement mindset’ or ‘beyond compliance’ are key phrases heard in the halls of organizations these days. What do these really mean? It means that there is an honest attempt to go beyond creating and following shared processes and standards, but to create a culture that is open to critical examination of how things get done (culture) and to incent people, not reprimand them, to find the faults and opportunities for improvement – and have the processes and attitude in place to adjust. The article is not blaming pilots alone for the error in judgment, but is pointing to the accuracy and applicability of the standard. The FAA, the Transportation Safety Board and the Flight Safety Foundation work to understand human behavior and how pilots come to make the judgments they make, in other words, what information, experience and other dynamics the pilots are drawing on in order to make these types of decisions. The article demonstrates how the safety organizations go about investigating until the problem is within an acceptable risk level. Their goal is to come as close to eliminating the error as they can. As someone who has been involved in Leadership Calgary for many years, I always knew the program had the potential to support social change – in fact, that is the explicit purpose of the program – but I hadn’t consciously considered how adaptive leadership and social innovation are connected and mutually supportive. It was a recent conversation with friends about social innovation that got me thinking about the power of understanding adaptive leadership and social innovation as linked and parallel processes. Although the term ‘social innovation’ has been around since the 1960s, it has recently become a huge buzz-word in the social sector. “Social innovation” is everywhere these days. It’s associated with social entrepreneurship, social finance, corporate social responsibility, social enterprise and a host of other tactical efforts to create social value. Despite all of these efforts, true social innovation continues to be elusive. The University of Waterloo defines social innovation as “Social innovation is an initiative, product, process or program that profoundly changes the basic routines, resource and authority flows or beliefs of any social system. Successful social innovations have durability and broad impact.” And a definition from the Stanford Social Innovation Review defines it as “A novel solution to a social problem that is more effective, efficient, sustainable, or just than existing solutions and for which the value created accrues primarily to society as a whole rather than private individuals.” Both definitions deal with a common theme: Change that creates and supports a more adaptive society. So, the question becomes: how do we create change that creates and supports a more adaptive society? Well, in order to understand social innovation we need to understand something about innovation generally. Innovation happens around us all the time: a new App, a better dog food, an improved running shoe, a medical discovery, new weapons systems, new finance & banking services, new marketing techniques, a new policy for supporting development in the developing world… the list goes on. It seems to me that the problem isn’t that we don’t know how to innovate: it’s that we don’t know how to innovate in ways that support sustainable, positive societal change over time. Innovations are driven by a range of motivations with different levels of understanding, care and concern for the common good. What looks like a great advance in one specialized area of interest can have highly destructive effects on society as a whole. This is where the notion of adaptive leadership comes in. The curriculum for Leadership Calgary is focused on how to develop adaptive – or pioneer – leadership: the kind of leadership required when we are at the edge of human capacity; when the challenges we face are emergent, unknown, complex and uncertain. Adaptive leadership influences the social ecology of organizations, communities and/or societies to help them meet these types of challenges, relying on the capacity for social innovation as part of the solution space for change. Both adaptive leadership and innovation have a common feature: they rely on ecologies of influences and cultures to support their development. This means that the capacity to create social innovation or adaptive leadership is dependent on the culture in which they are being developed. All cultures have both healthy and toxic components – so adaptive leaders and social innovators must have the capacity to draw on the healthy components in order to create change that will be adaptive over time. No small task, but it’s possible and we have examples in history of how this has been done. Literature and educational programs on social innovation tend to focus on specific systems: food production, urban design, poverty, hunger, justice, homelessness… But true social innovation can’t be understood by focusing only on the system we want to change: that’s like looking at a flower expecting it to give us all the answers on what is required to make it grow. We need to look at the entire culture and concurrent, interlocking systems – how they have been constructed and how they function – in order to understand how to innovate in any specific system. An example of this is explored in a recent article which outlines how the airline industry created the National Transportation Safety Board (NTSB), and how the development of the NTSB could lead to social innovation within the healthcare sector, with the potential to ultimately save tens of thousands of lives every year. The structures of social innovation and adaptive leadership have several foundational components in common which support successful change: prevention, creativity, strategic planning, ethics, resilience, critical thinking, expertise and sustainability. These are all core processes of learning that are required for structuring our organizations, communities, societies in ways that support innovation. Of course, doing this requires a level of intelligence – thinking, caring, acting and learning – that goes beyond what is required of most of us on a day-to-day basis. As Einstein is quoted as saying “We can not solve our problems with the same level of thinking that created them”. This should beg the question then, how do we design new ways of thinking? This is the critical question of our time, and is the focus of the Leadership Calgary curriculum. Any social innovation, and any form of adaptive leadership must include the components of empowerment and learning. The innovation or leadership capacity must go deeper than creating a solution for a problem in a moment of time: it must address the underlying processes required for that change to remain adaptive over time for society as a whole. After all, that’s what life is about: our ability to adapt, in an increasingly progressive way, to the challenges and opportunities we face. In that sense, social innovation and adaptive leadership cannot be achieved without the other – they are inexorably linked. Leadership Calgary Purpose Statement listed at the end of this document. Also known as pioneer leadership. Social innovators and adaptive leaders also have a responsibility to contribute back to the culture in healthy ways: true social innovation and adaptive leadership will do this by definition. Meta-Framework for Adaptive Thoughtscape Construction. Map 27.08. Ken Low, 2004. Blythe and Natalie have a passion for creating innovative and strategic solutions for complex challenges by drawing on proven strategy, project, change and culture management methods. Natalie and Blythe draw on their combined experience and thought leadership for their joint venture: Calibra-tion.